Joanna trained at the University College of Creative Arts at Farnham, Surrey and as a post-graduate at Glasgow School of Art. She set up her studio in 1989, moving to Glasgow in 1994 where she is currently based. Working on natural fabrics—linen and wool are favourites–Joanna combines dyeing, screen-printing and painting using reactive dyes, discharge and devoré. Imagery is translated through a series of layers, building up and stripping away colour. The process involves design development, creating and transferring imagery to screens photographically, sampling, fixation and finishing. Joanna’s detailed and extensive technical dye records create a huge palette of colour options allowing a continuity of process. The action of transcribing imagery to a surface via a screen takes a matter of seconds and belies all the hard work done at the preliminary stages. 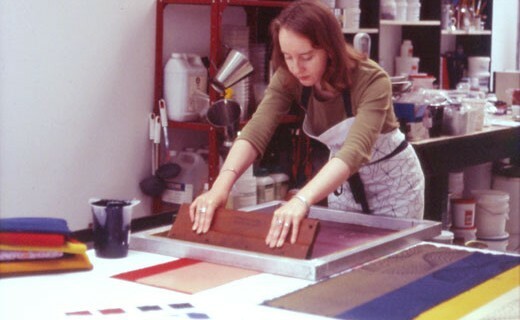 The physicality of screen-printing is important to Joanna. With all the subtleties of application, the process allows endless permutations and enables both a planned and spontaneous approach, which suits the way her ideas evolve. Joanna’s work has been exhibited in the UK and abroad, as well as appearing in books and magazines; she has been a member of the 62 Group of Textile Artists since 1997. She is the author of the popular ‘Dyeing and Screen-Printing on Textiles’; first published by A & C Black in 2003, the second edition came out in March 2012. Joanna is a visiting lecturer at degree level, runs five day and weekend courses in her studio and is also available for talks.